INTRODUCTION: The aloe vera aphid, Aloephagus myersi Essig, was found on an aloe vera plant in a discount store in Deltona, Florida, by Plant Industry inspector Stacey Simmons on 2 October 2002. 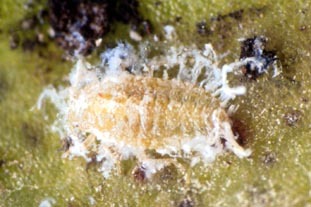 This aphid is known to occur in California, but has not been reported before in Florida. 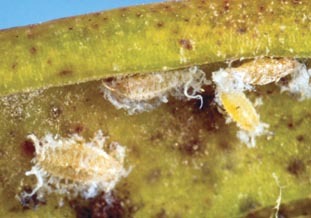 Aloe vera aphids are covered with fuzzy whitish wax. They feed at the bases of the leaves, or in rolled ends of damaged leaves. Soiling from honey dew and sooty mold can be extensive. Fig. 1. Aloe vera aphid. Fig. 3. Aloe vera aphid leaf damage. Aphids are inside rolled leaf. Fig. 2. Aloe vera aphid colony. Fig. 4. Aloe vera aphid plant damage. 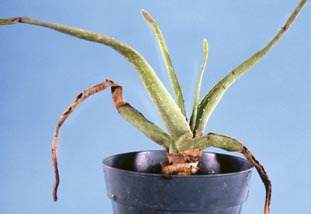 HOSTS: In the USA, the only known hosts are Aloe spp. In tropical Africa, host alternation (probably with gall formation) to Pistacia is suspected, but not documented (Blackman and Eastop 1994). DISTRIBUTION: Aloe vera aphids were described from California, but probably are native to tropical Africa (Blackman and Eastop 1994). They also are found in greenhouses in Europe. Blackman, R.L., and V.F. Eastop. 1994. Aphids on the World's Trees. CABI, Wallingford, U.K.